Apart from the UN General Assembly, the biggest gathering of world leaders takes place in Brussels this week, the biannual Asia-Europe meeting, known as ASEM. Representing two-thirds of the world’s population, trade and GDP, Europe and Asia have lots to discuss, writes Fraser Cameron. Fraser Cameron is the director of the EU-Asia Centre. There are signs that this year’s ASEM – scorned by some as a glorious talk fest for its 53 members – will be more meaty. First, it takes place right after the European Council ensuring a high-level representation on the EU side. The Asian side is also bringing a full quota of heavyweights including Japan’s Shinzo Abe, China’s Le Keqiang, Russia’ Dmitri Medvedev and Vietnam’s Nguyen Xuan Phuc. Second, most countries are being caught up in the tariff war launched by the one world leader who will not be present, Donald Trump. The ghost of Trump, however, will haunt the proceedings as Europeans and Asians alike discuss how to deal with the current occupant of the White House. 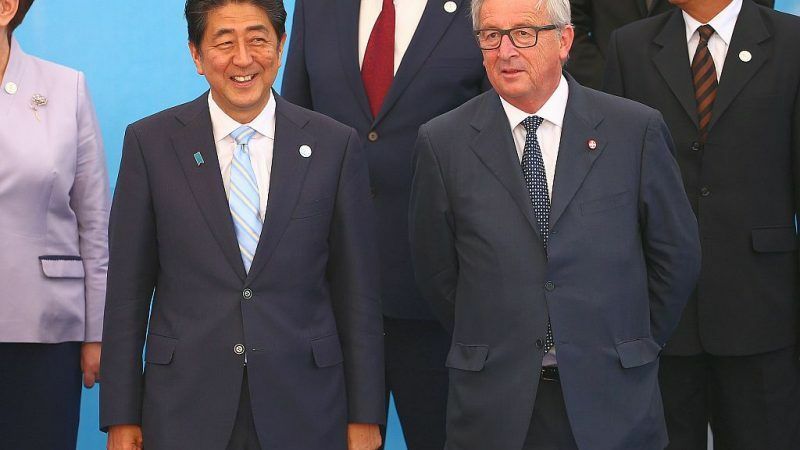 As the US retreats into quasi-isolationism, this is a golden opportunity for the EU and Asia to get their act together in defending the rules-based, multilateral system, and also working out how better to connect their two continents. No doubt Asian leaders will wish to be briefed on the outcome of the Brexit talks but their own agenda will feature the future of the WTO, the Paris Climate change agreements and the Iran nuclear deal as well as connectivity. Trump’s growing trade war with China poses a risk to the global economy, still struggling to recover from the financial crisis a decade ago. Trump is trying to enlist the support of the EU, Japan and others in his fight with China. But it is not easy to find support when imposing sanctions and tariffs on your allies. At the same time, there is no question the WTO needs reform so ASEM leaders should discuss how to go about it. There may be some disagreement, however, as China is likely to defend its economic system against those opposed to industrial subsidies. On climate change, there is broad agreement to uphold the Paris accords against the attack from Trump. There has been some backsliding by Asian powers on commitments undertaken at Paris, so ASEM will be an opportunity to re-emphasise the importance of maintaining energy-reducing targets. The imminent imposition of American sanctions on Iran and countries trading with Iran will also be a heated topic. The EU is trying to devise an alternative payments system to be used for Iran trade. The more countries that agree to support it the more credible the system will be. Asians and Europeans have recently mused about the increased influence the US gains from having the dollar as the world’s leading trading currency. The EU calls for the highest standards on the environment, labour rights and financing. It warns of the debt crisis facing some countries that borrowed too heavily from China. The weakness of the EU strategy, however, is the relative lack of finance compared to China’s largesse, debt traps or not. On other global issues, there is clearly a need for Europe and Asia to cooperate more. Federica Mogherini has been an assiduous participant in the annual ASEAN Regional Forum (ARF) demonstrating the EU’s comprehensive approach to security (eg the counter-piracy Operation Atalanta) while seeking to gain a seat on other bodies such as the East Asia Summit. There is still some tension between Asian members of ASEM on issues such as the South China Sea but ASEM is a good forum to discuss differences and seek solutions. Mogherini won backing from the European Council in May for the EU to up its security game in Asia. It stated that cooperation with Asia should focus more on the achievement of “tangible results in addressing shared security challenges”, in particular in the fields of maritime and cyber security, counter-terrorism, hybrid threats, conflict prevention, non-proliferation and the development of regional cooperative orders. The importance of platforms such as the Asia-Europe Meeting (ASEM) in achieving these ambitious goals is clear. One of ASEM’s greatest strengths is that it has a solid bottom-up dimension, bringing together governments as well as parliaments, the private sector, the academic community and civil society organisations. It therefore has the capacity to engage with several different stakeholders. ASEM turns 22 this year. It has got over its teenage tantrums and is turning into a responsible young adult. It still needs nurturing but no one can deny that it has a useful role to play in today’s highly uncertain world.